How do I run calibration sessions with Hiring Managers in Gem? You can now submit candidates for review to a teammate (e.g. a hiring manager) directly from your Gem Project. Click Request Review, write a quick note, and add the reviewer’s email address. 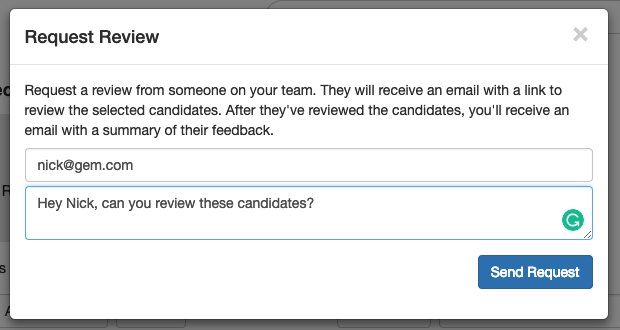 Reviewers will get an email notification with your note and a link to the candidates they have to review. Clicking the link directs your hiring manager to sign in to Gem and directs them to https://www.gem.com/review. Note, that we won’t require reviewers install the extension or force them through our normal onboarding flow. From there, clicking “review all” starts a light-weight review flow where your Hiring Manager can leave an optional note and assign one of 3 decisions (pass / accept / star). 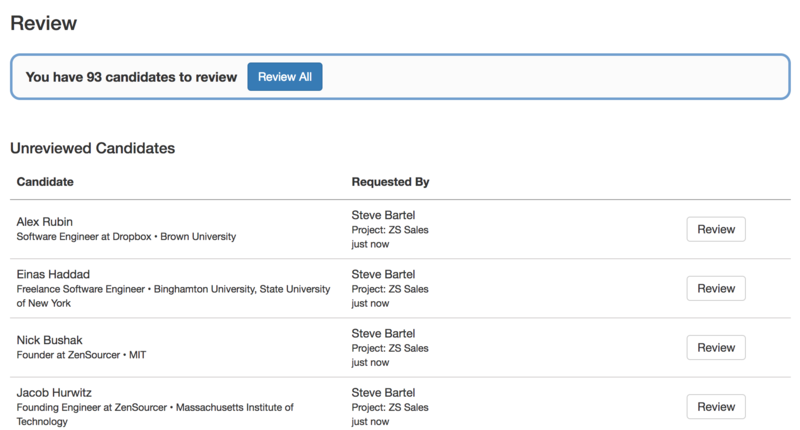 Once your hiring manager finishes the review, you can revisit your Gem Project and see the review status and notes. Hover over a note icon to see feedback. You can also sort by review status, select everyone with an accept / star & add directly to a sequence. Need help setting up Hiring Manager Reviews? Feel free to reach out to the Gem team by emailing us directly at support@gem.com or press "Chat with Us" in the Gem home page.